With vacation season in full effect and Spring Break around the corner, I’ve teamed up with Gillette Venus to give you guys 5 easy ways to achieve pool-ready legs! Not only does exfoliating remove dead skin, it also increases your blood circulation, which gives your skin a beautiful, healthy glow! Plus by removing the dead skin, it will help lift your hair up, which will make it easier for the razor to grab. This is a no-brainer!! Who want’s to go to the pool with hairy legs?! I know I don’t!! I have gone through my fair share of razors though. A lot of them have cut me and it’s taken me a long time to find the perfect one. One that leaves my skin silk smooth and doesn’t irritate my skin. Please tell me I’m not the only one?! Because the struggle was REAL! But thanks to Gillette Venus, specifically their new Platinum Extra Smooth, I can now achieve that extra smooth feel for longer! The advanced blade technology allows the razor to stay sharper for more shaves and I find that all the other razors I’ve used, dull after just one or two uses!! So that was obviously a HUGE plus for me. And I also love their sleek, new, metal handle, which has the perfect weight to it, for great control, plus an anti-slip texture for better grip in the shower. And for bikini season, I pair the Venus Platinum Extra Smooth with the new Venus Bikini Precision! It’s sleek design and 90-degree angle head makes it super easy to hold and control when I’m shaving around the bikini area. And it’s battery-powered so you can take it on the go! Perfect for last-minute touch-ups! But as if it couldn’t get any better, both of these hair removal products are under $20 each! Super affordable and accessible! These babies can be found both online and in-store at Walmart. 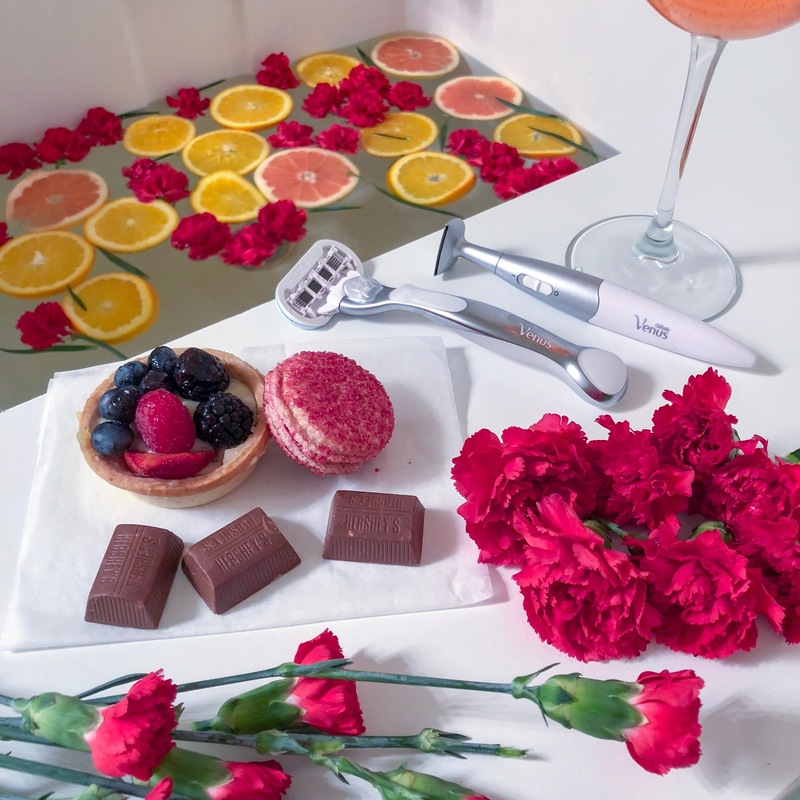 So if you’re struggling to find the right razor, CHECK THESE OUT! I’m a HUGE fan of spray tans! When I was in college I used to actually tan in the tanning bed (CRINGE!) and it wasn’t until DeAndre and my mom told me to stop going, that I realized JUST HOW BAD it was!.. But the problem was, I still wanted to be tan!! So I finally pulled the trigger and made an appointment for an airbrush spray tan (despite hearing some horror stories about turning out orange)! Luckily for me, that never happened and from that day on, I was hooked and never looked back! 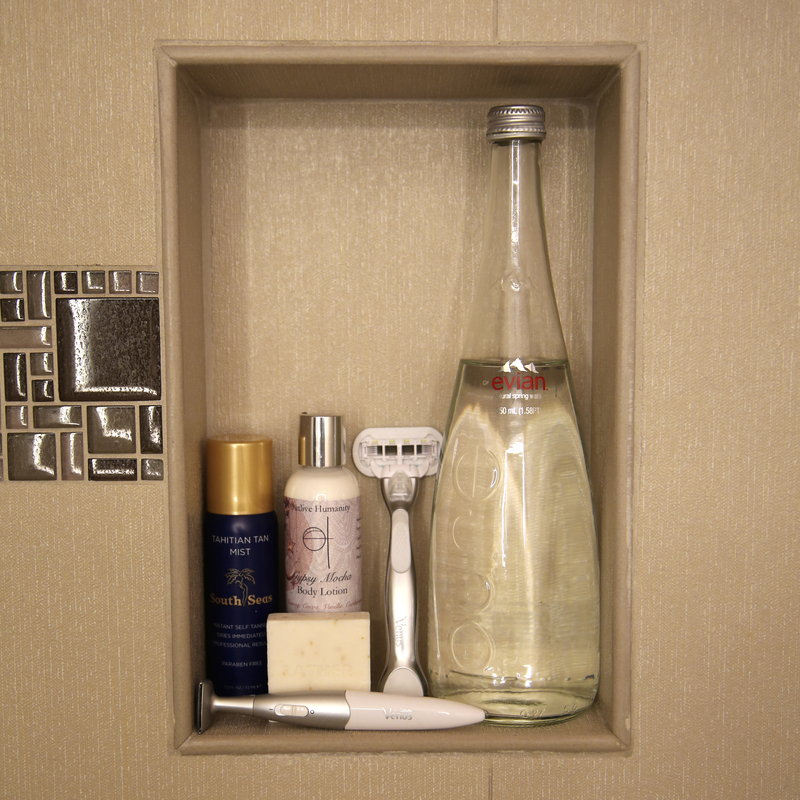 A good spray makes you feel confident and completes the whole look in my opinion! You guys, you HAVE to moisturize! Not only will your spray tan go away if you don’t moisturize, let’s be real… Nobody has time for ashy skin! Plus your smooth legs will look amazing with a hint of moisturizer! Hydrate. Hydrate. Hydrate! Especially in the warm sunshine, you’re gonna to want to make sure you’re keeping your body hydrated! It keeps your skin looking youthful – legs included obviously and leaves your skin looking supple and smooth. It also prevents and reduces cellulite in the future! If that’s not amazing, I don’t know what is!! So there you have it! Your 5 Easy Ways To Achieve Pool-Ready Legs! Know any other awesome tips that you think I might have missed? Share them below!! I’d love to try them out! Summer is in full effect for us here in Cali, so I’m definitely alllllll ears! Thanks for reading guys!! I should have another post coming out this week, so stay tuned! And until then, be sure to check out my Instagram stories for daily updates! Thank you Gillette for sponsoring this post! Previous Post Benefits of Yoga + A FREE Month at CorePower Yoga! Next Post My Experience Trying CoolSculpting! Thanks for these tips! Just pinned this! doesn’t it?! crazy what that can do! Happy Tuesday and thanks for reading Perrine! I need to do some of these and fast! (and exercise, I’ve become a bit squishier in the winter months. Any tips on what not to do? haha same here!! and hmm.. def don’t use a dull razor as it can cause razor bumps!!! oh no!!! lol! I hope these help!! Happy Tuesday! Some people forget these every day things we need to do. Not just to be pool ready. But I’m happy the warm weather is here! Great tips! Exfoliating before shaving is a must! Yes!! Thanks for reading love! Summet is around the corner ahhh! Gilette are my absolute favourite razor brand! Love them. I always forget to exfoliate – thanks for the reminder!